Here is the update I promised albeit a little later than intended (been moving sheds in the allotment etc. etc..!) and is primarily a series of pictures showing the progress with the basics of the track construction and the extra mileage for the bus to travel. All of the track on the extension is, as you would expect, Easitrac. The first picture shows the cast bases procured by the Easitrac team to assist with baseboard joints and track feeds. 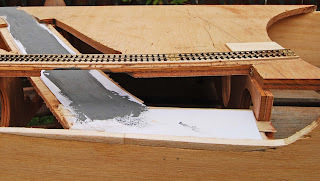 In this instance they are being used as baseboard end 'anchors' this particular part of the baseboard being the train table fiddle yard. Clearly seen are the isolating cuts. The sleepers can be cut anywhere in the 4' foot way but I have chosen to cut them in the centre and because there is little need for any infill here I have left quite a wide gap. On the scenic section these gaps will be filled with something like Milliput. 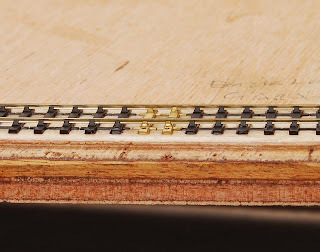 I have drilled four holes for each sleeper one either side of the rail to fix them to board with pins. One thing I did notice with the cast sleepers is when cast they come out slightly larger than the styrene bases that went into the casting process so they do need to be cut before 'threading' them on to the rail' since if left untouched they will be slightly over gauge. I chose to do this with a piercing saw as opposed to a grinding disc. 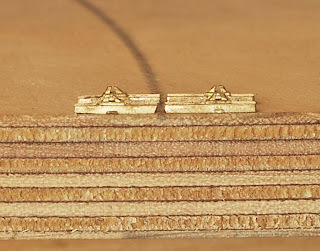 The second shot shows brass bases in the scenic section. 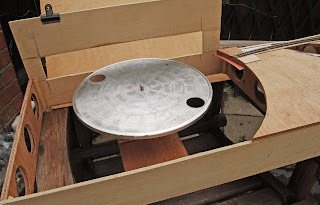 The last two pictures show the basis of the traintable, an old record player turntable deck, and a second shot with some track laid thereon. 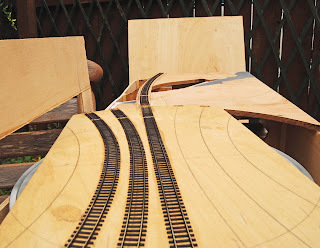 I completed the tracklaying on the layout extension and the traintable in under four hours. You'll be spinning lots of 33s and 45s on your turntable then!